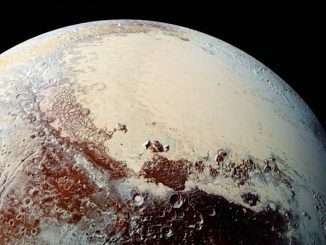 The robotic science probe will require the perfect execution of a carefully-choreographed, pre-programmed sequence relying on a heat shield, a supersonic parachute, pyrotechnics, a radar, and 12 fast-pulsing braking rockets to safely reach the surface. “Landing on Mars is never a foregone conclusion, and less than half the times we’ve tried to either get into orbit or land on Mars, we have not been successful,” said Tom Hoffman, InSight project manager at NASA’s Jet Propulsion Laboratory. InSight will have more mass entering the atmosphere — about 1,340 pounds (608 kilograms) vs. 1,263 pounds (573 kilograms). InSight will land at an elevation about 4,900 feet (1.5 kilometers) higher than Phoenix did, so it will have less atmosphere to use for deceleration. InSight will land during a Martian season (early winter in the northern hemisphere) when dust storms have grown to global proportions in some prior Martian years. In order to address some of the differences, InSight uses a thicker heat shield capable of withstanding “sandblasting” by a Martian dust storm, and its parachute will open at a higher speed than Phoenix’s chute. The parachute suspension lines on InSight also use stronger materials, according to NASA. InSight’s flying saucer-shaped entry vehicle measures around 8.7 feet (2.64 meters) in diameter, and its heat shield is made of an ablative material composed primarily of crushed cork, which will burn away during the scorching hypersonic passage through the Martian atmosphere. 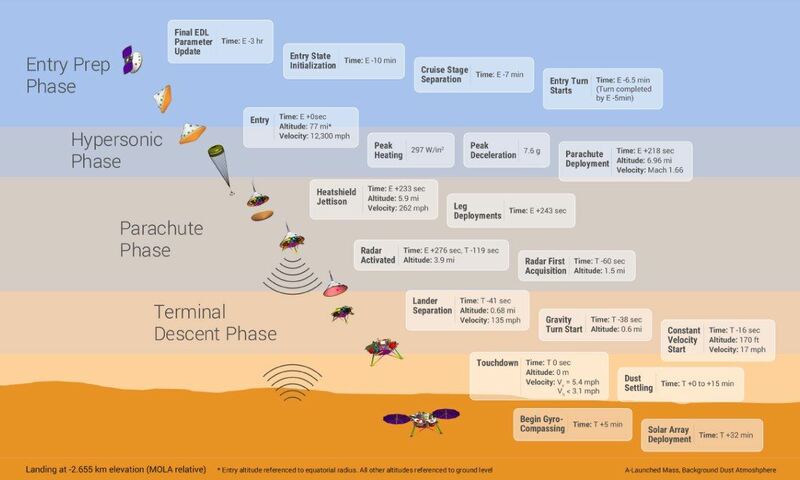 Landing is scheduled for 2:54 p.m. EST (11:54 a.m. PST; 1954 GMT) Monday, a time that includes an 8.1-minute delay for radio signals to travel from Mars to Earth. 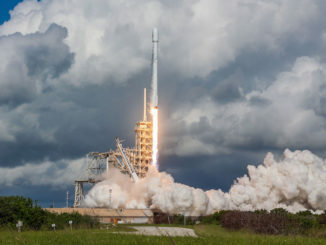 The lander will transmit a UHF signal throughout the entry, descent and landing to NASA’s MarCO CubeSats, which accompanied InSight on its launch to Mars in May. If they work, the twin MarCO spacecraft, each about the size of a briefcase, will relay the signal back to Earth in X-band as they zip past Mars on a flyby trajectory. But the CubeSats are an experimental part of the mission, and they don’t have to work for InSight to successfully land on Mars. The primary way engineers plan to receive data from InSight is through the Mars Reconnaissance Orbiter, a satellite flying around Mars, which will listen for the lander’s signals during its descent. MRO is unable to simultaneously listen for InSight’s signal and transmit to Earth, so the data will be stored aboard the satellite and replayed back to the ground later Monday. In addition to the spacecraft at Mars listening for InSight, the two huge radio telescopes in West Virginia and Germany will listen for the lander’s beacon transmitted directly to Earth. Engineers hope to measure the Doppler shift in that signal to discern whether InSight has deployed its parachute, and jettisoned its heat shield. After landing, InSight will send out two signals confirming it has reached the surface: a “tone beacon” through its UHF antenna and a “beep” through its X-band antenna. “This X-band ‘beep’ is expected to turn on about seven minutes after landing, and will be a clear indicator that InSight is functional on the surface,” officials wrote in the press kit for InSight’s landing. 13 minutes, 35 seconds before landing: InSight jettisons its cruise stage before encountering the Martian atmosphere. The cruise stage provided power to the spacecraft during the more than six-month, 301-million-mile (484-million-kilometer) journey to Earth. The cruise stage will burn up in the Martian atmosphere, and InSight will rely on internal battery power until it can deploy its solar panels after touchdown. 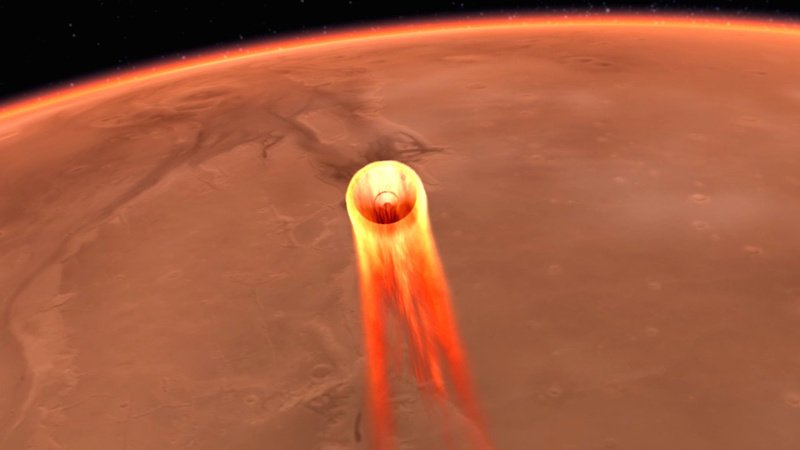 13 minutes, 5 seconds before landing: InSight begins a turn using small control thrusters to the correct orientation for entry into the Martian atmosphere, with its heat shield facing in the direction of travel. 6 minutes, 35 seconds before landing: InSight encounters the first traces of the upper Martian atmosphere at a speed of 12,300 mph (5.5 kilometers) per second and an altitude of 77 miles (124 kilometers). 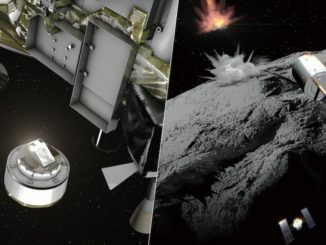 5 minutes, 5 seconds before landing: InSight reaches the point of peak heating during entry, with temperatures on the heat shield reaching 2,700 degrees Fahrenheit (1,500 degrees Celsius). 4 minutes, 50 seconds before landing: InSight reaches the point of maximum deceleration, around 7.6 g, as aerodynamic friction slows the spacecraft. 2 minutes, 57 seconds before landing: InSight’s on-board computer deploys its 39-foot-diameter (11.8-meter) supersonic parachute once predetermined velocity and deceleration conditions are met. The chute will deploy at an estimated speed of 861 mph (385 meters per second), and at an altitude of approximately 36,400 feet (11,100 meters) above ground level. The anticipated load on the parachute at deployment is about 12,500 pounds of force (55,600 newtons). 2 minutes, 47 seconds before landing: InSight’s landing radar is activated to begin warming up, and an auxiliary battery is switched on to supplement the lander’s primary battery during the upcoming key landing events. 2 minutes, 42 seconds before landing: InSight jettisons its heat shield, which falls to a crash landing on the Martian surface. 2 minutes, 32 seconds before landing: Pyrotechnic actuators extend InSight’s three landing legs and lock them into position for touchdown. 1 minute before landing: InSight’s radar begins sensing the Martian surface at an altitude of around 7,900 feet (2,400 meters), feeding distance and descent rate data to the lander’s guidance system. 45 seconds before landing: InSight releases from its backshell at a speed of around 134 mph (60 meters per second) and an altitude of approximately 3,600 feet (1,100 meters). NASA expects a brief pause in communication from InSight at this time as data transmission shifts from the wrap-around antenna on the backshell to a helical UHF transmitter on the lander. 44 seconds before landing: One second after backshell separation, the lander begins firing 12 braking rockets, pulsing on and off 10 times per second, to slow its descent velocity and null out horizontal movements. The spacecraft also rotates to ensure it is in the correct orientation for touchdown, with its solar arrays extending east and west from the deck, and the robotic arm’s work area on the south side of the lander. 15 seconds before landing: Around 164 feet (50 meters) above the surface, InSight transitions to a constant velocity mode. Landing: InSight reaches the surface at a velocity of around 5 mph (2.24 meters per second), and immediately switches off its liquid-fueled thrusters. 16 minutes after landing: After waiting for dust to settle at the landing site, InSight’s two solar arrays begin unfurling in a pre-programmed sequence. The fan-like panels take about 16 minutes to deploy, with the activity concluding approximately 32 minutes after touchdown. Confirmation of solar array deployment will be relayed by the Mars Odyssey orbiter several hours after landing.